Looking at photographs of old underground stock back in the early part of the 20th century, it appears that none of them were fitted with windscreen wipers. I'm betting that they didn't have any form of demisters either. Which begs the question, how did they see where they were going in the open air sections when it was raining or icy? I suspect that the stock you have seen photographs of are stock for Underground lines that at the time had no open air sections. Back in the early part of the 20th c. most of what is now the London Underground would have had steam engines pulling normal coaching stock. Steam locomotives cope without wipers, you just put your head out of the side window a little. 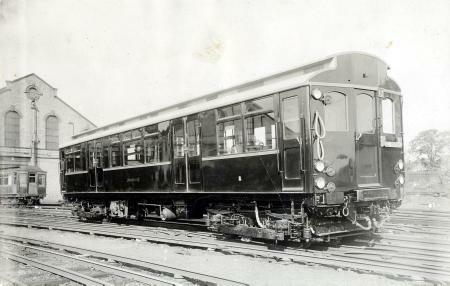 Here's a picture of a 1923 District G-stock. Can't see any wipers and it definitely ran in open air sections. It seems a simple non pantograph type so wouldn't have wiped much of the window. Possibly that also appears in the as new picture if you look carefully. Don't forget the driver was much closer to the windscreen in those days. Many drove standing up and I guess they were expected to adjust their head and eye positions much more than now to sight things. I seem to recall being told that a wipe over the glass with the newsprint of those days helped both to clean it and act as a wetting agent to break up water drops. That certainly worked on CO/CP and R Stock, where the “windscreen wiper” moved slower than an asthmatic snail. Half a raw potato was a good method too. To stop the th windscreen fogging up a new bar of soap and newspaper worked great as well. I would imagine the O/P/Q38 and 1931 tube stocks were the first to have them. The rest were retrofitted. The first patents for windscreen wipers were issued in 1903, but they didn't become common until after WW1. But of course many early vehicles didn't have windscreens anyway - the Metropolitan Police did not allow London buses and trams to have them until 1929. Question - were windscreens a rarity simply because there was no way to keep them clear, or was there no demand for windscreen wipers until windscreens came into common use?